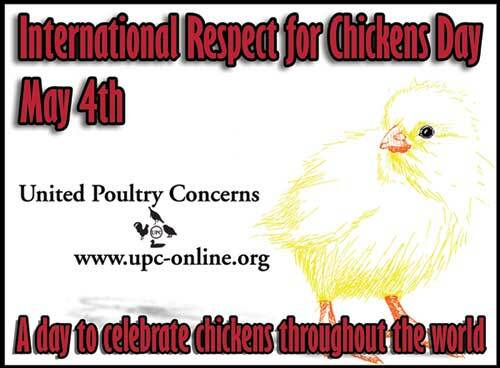 Please do an ACTION for chickens on or around May 4. Ideas include leafleting on a busy street corner, holding an office party or classroom celebration, writing a letter to the editor, doing a radio call-in, tabling at your local church, school or shopping mall, hosting a vegan open house, or simply talking to family, friends or strangers about the plight – and delight – of chickens and how people can help them. Order posters & brochures at www.upc-online.org/merchandise/.